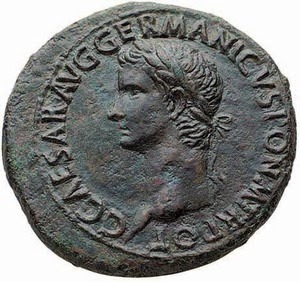 Born in 12 A.D. in Antium, the third son of Germanicus and Agrippina the Elder, Gaius Julius Caesar Germanicus lived under the shadow of his parents and older brothers, Nero and Drusus Caesar. His family was arrested and punished for treasonous conspiracy, charges brought about by rumors started by Tiberius' companion, Sejanus. Following their arrest and banishment, in a period of four years, all but Gaius were dead. Tiberius in the waning years of his reign, needed to consider who would succeed him as emperor. He chose to appoint joint heirs, those being Gaius and Tiberius Gemellus, the son of Drusus the younger. Though joint heirs, it was made clear that the true occupant of the throne would be Gaius. It has been rumored that Gaius was responsible for Tiberius' death, but it is likely that he died from natural causes. Also, it is an often told story that Gaius' nickname of Caligula came from his childhood, when he wore miniature army boots known as caligae. 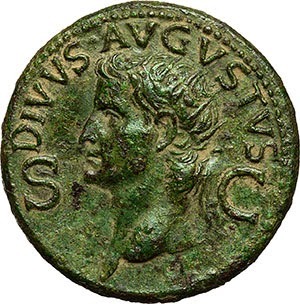 Gaius' ascent to the throne started during Tiberius' lifetime, with appointments as both a priest and a quaestor. Upon the death of Tiberius, the senate elevated him to princeps almost immediately. The senate nullified the will of Tiberius, thus giving Gaius all power and the entirety of his estate, thus leaving Tiberius Gemellus without anything. Gaius was also the favorite of the army, giving him real power to back up the imperial titles he was given. Soon after ascent to the throne, Gaius became extremely ill, but recovered. It was at this point that his legendary paranoia kicked in. He had many of his closest supporters executed, and he instituted treason trials for those who opposed him, especially those in the senate. He also had his sisters Agrippina the younger and Julia Drusilla banished, and he put his brother-in-law Marcus Lepidus to death, on rumors of conspiracy against the emperor. The more erratic Gaius' behavior became, the more actual assassination plots started to form against him. He traveled with a military bodyguard wherever he went. Finally, members of the senate itself formed a conspiracy against him. The person chosen as the assassin was Cassius Chaerea, who was a senior praetorian officer. An ambush was planned in a passage under the palace on the Palatine Hill. 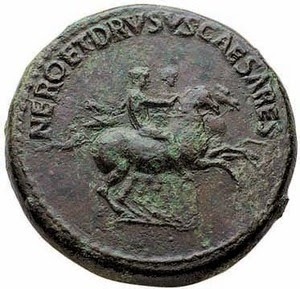 Cassius Chaerea and two others attacked Gaius, stabbing him to death. They also killed his wife, Caesonia and their baby daughter. 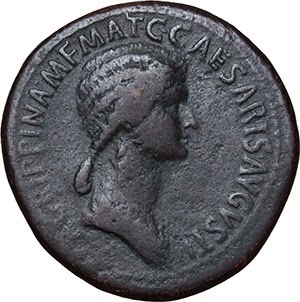 Part of Gaius' numismatic legacy was the issuance of coins honoring his sisters, including Agrippina the younger. These coins bore images that resembled deified personages of earlier coinage, and were issued in a large format with relatively high style portraiture. 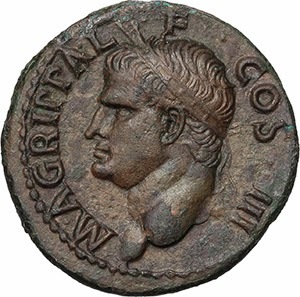 Others honored on the coinage of Gaius include Nero and Drusus Caesar and Marcus Agrippa, along with coinage of the deified Augustus.